Powered control line aerobatic model aircraft in which all aerodynamic surfaces (except for the propeller plus that/those surface/s used to control the flight path) remain fixed during flight. d) Permitted power sources shall include any power except rocket motors. Piston engine/s shall be subject to a total swept volume limitation of 15 cm3. Electric power shall be limited to a maximum no-load voltage of 42 volts. Gas turbine engines shall be limited to 10 N static thrust. A suitable silencer must be used on all piston engines. The noise limit set out at paragraph 4.2.6 c) shall apply to all power sources. e) Wireless remote control (electrical, optical, or any other) of any control function of, and/or of any system in the model aircraft shall not be permitted. f) The following exceptions to rule 1.3.2 of Section 4C of Volume ABR are allowed. i) Other controls may include, but are not limited to: landing gear operation and built-in engine starters. Such functions may be controlled by the pilot only via line/lines, or may function completely automatically. The frequency of any electromagnetic pulses transmitted through wires/cables to the model aircraft shall not exceed 30 kHz. – Passive or static devices controlling rate of fuel flow or fuel pressure (for example “uniflow” fuel tanks). – Passive or static exhaust systems (for example tuned-length exhaust pipes to control engine rpm). – Provided they are used only to end a flight, the use of engine/s shut-off systems, either operated by the pilot or functioning fully automatically, shall be permitted, subject to the restriction at paragraph e) above. g) For power sources other than piston engines, engine power controlling systems, whether pilot-operated or automatic, shall be permitted. h) Rule B.3.1. of Section 4B of Volume ABR does not apply to class F2B. The minimum length of control lines shall be 15.0 meters, the maximum length 21.5 metres, to be measured from the centre-line of the grip of the control handle to the centre-line of the propeller. Where model aircraft with multiple power sources are used the longitudinal (fore and aft) centre line of the model aircraft shall be taken as the reference for measurement. a) The length of the control lines shall be checked before every contest flight. b) Not less than 20 minutes and not more than 1 hour before every contest flight a test load of 10 times the total weight of the model aircraft without fuel shall be evenly and smoothly applied to the assembled control handle, lines, and model aircraft. The load used in this test shall be applied once only to the control handle in such a way that the test load is equally distributed between both flight lines/cables during the whole pull test. c) If the control lines are disconnected from a competitor’s model aircraft after a the pull test has been performed but before making the respective contest flight then that competitor’s control lines and model aircraft shall again pass the above lines length check and pull test before making the respective official flight. No contest flight shall be started when the wind speed is equal to or greater than 9 metres per second for a continuous period of 30 seconds, as measured from the height of a person standing on the ground holding the measuring instrument overhead at arms-length. In the event of such conditions occurring the F2B Contest director and Head Judge shall agree a suitable delay to the contest timetable and shall inform all contestants and contest officials as soon as is practicable.For safety reasons any competitor whose contest flight is in progress during local electrical storm activity (thunder and/or lightning) shall be offered a re-flight. No contest flight shall be started when an electrical storm appears to be imminent, and if such conditions do occur the F2B Contest Director and Head Judge shall agree a suitable delay to the contest timetable and shall inform all contestants and contest officials as soon as is practicable. a) The noise level of any competitor’s model aircraft shall be officially measured if requested by the F2B Contest Director, or the Head Judge, or an FAI jury member present at the contest site. Such requests shall only be made if in the opinion of the official requesting the noise test the model aircraft concerned seems to have a noise level higher than specified at paragraph c) below during an official flight. All requests for an official noise test shall be made only to the F2B Contest Director. b) If an official noise measurement test is requested the F2B Contest Director shall arrange this. At the same time, the F2B Contest Director shall also immediately retrieve from the Head Judge all score sheets for the respective competitor’s Contest Flight in which the request for official noise test was made. If not performing the noise test himself the F2B Contest Director shall officially observe the test. c) The official noise test procedure shall be for a noise meter to be positioned at 3 metres from the longitudinal (fore and aft) centre line of the model aircraft, with the model aircraft placed on the ground (ideally over a concrete or asphalt surface) adjacent to the contest flight circle, and with the inboard wingtip of the model aircraft facing towards the wind (when the model aircraft is set up to fly anti-clockwise). With the motor running at it’s normal Take-off power setting, measurement shall be taken at 90 degrees to the flight path of the model aircraft, from the side of the model aircraft which is towards the outside of the model aircraft’s flight path, and with the noise meter microphone placed on a stand 30 cm above the ground and in line with the motor/s. No noise-reflecting object shall be nearer than 3 metres from the model aircraft or from the noise meter microphone when measurement is taking place. If performed on a concrete or asphalt surface the maximum permitted noise level shall be 96 dB(A). If a hard surface is not available then the noise measurement may be taken over grass but in this case the grass shall not exceed 2.5 cm in length. When measuring noise over grass the maximum permitted noise level shall be 94 dB(A). d) The official noise test shall be carried out within the shortest practicable time after the model aircraft has landed from the flight during which the request for noise test was made, and apart from refuelling, no change or adjustment or modification of any kind shall be made to the model aircraft before performing the official noise test. e) If the model aircraft fails the first official noise test then the competitor shall be informed immediately and the model aircraft shall be impounded by the F2B Contest Director until a second noise meter is brought to the contest flight circle area. The model aircraft shall then be officially re-tested using the second noise meter and using the same procedure as at paragraph c) above. f) If passing the second official noise test the model aircraft shall be considered to have passed the official noise measurement test, then the scores which were awarded for the official flight in which the request for noise test was made are processed as normal. g) If failing the second official noise test the F2B Contest Director shall return the model aircraft to the competitor for modification/adjustment and shall also mark the respective score sheets with the remark “N, Score 0” (zero points). h) Any competitor may, if he wishes, ask the F2B Contest Director to arrange an unofficial noise measurement test of his own model aircraft. This shall be performed as soon as is convenient, and in accordance with the procedure set out at paragraph c) above. a) When a registered competitor makes a flight which is intended to record a score in the contest, it shall be referred to as a contest flight. A contest flight shall become an official flight at the moment the model aircraft is released to start the take-off manoeuvre. All official flights shall result in a score being recorded against the respective competitor’s name, except in the case of a re-flight being awarded and accepted, as provided at paragraph h) below. b) All contests shall be organised on the basis of rounds, a round being defined as complete when all registered competitors have completed their official flight or have made two attempts. At contests which include a fly-off, all rounds flown before the fly-off shall be referred to as elimination rounds and all rounds flown after completion of the elimination rounds shall be referred to as fly-off rounds. c) All rounds which cannot be completed within one day shall be continued on the next day of the contest and shall be flown on the same contest flight circle and with the same judging panel as scheduled for the beginning (previous day) of that round. iii) or if the competitor himself declares an attempt before releasing the model aircraft for the take-off manoeuvre. In each of the above cases the judges shall all record an attempt by a mark on the score sheet of the respective competitor. e) After making a first attempt the competitor may choose to remain in the contest flight circle, in which case he shall make his second attempt immediately. f) Alternatively the competitor may choose to leave the contest flight circle after his first attempt, in which case he shall then be officially called to make a second attempt at the same contest flight circle after 30 minutes have elapsed from leaving the contest flight circle after his first attempt. This 30-minute rule shall apply even if the competitor’s first attempt occurred at or near the end of the respective round. iii) or the competitor himself declares an attempt before releasing the model aircraft for the take-off manoeuvre. Then the judges shall all record an attempt by a mark of 0 (zero) points on the score sheet of the respective competitor. iii) a safety-related incident which is outside the competitor’s control occurs during an official flight, and if said incident has impaired the respective competitor’s ability to fly the sequence of manoeuvres. For the purposes of illustration only, such a safety-related incident could be, but shall not limited to an un-supervised child or animal wandering into the contest flight circle during an official flight. In all of the above cases the competitor shall not have the respective official flight marked as an attempt and shall not be scored 0 (zero) points. Instead the judges shall retain the original score sheets and the Head Judge shall, offer the competitor a re-flight. The marks awarded during the official flight in which the incident took place shall not be disclosed to the competitor. Therefore all competitors accepting a re-flight do so on the understanding that the scores awarded during the official flight in which the incident took place shall be deleted and replaced by whatever scores are awarded during the re flight. If a re-flight is accepted, then this shall be performed as soon as possible after the competitor has accepted the re-flight, and on the same contest flight circle and with the same panel of judges as the official flight during which the incident took place. Contests may be held either at sites with one contest flight circle available (hereafter a “Single Circle” format contest), or at sites with two contest flight circles available (hereafter a “Double-Circle” format contest).At all Single-Circle format contests organisers shall schedule the contest so that all registered competitors fly a minimum of 3 rounds (3 elimination rounds at contests where a fly-off is to be included). At Double-Circle format contests organisers shall schedule the contest so that all registered competitors fly a minimum of 2 rounds per contest circle to be used (2 elimination rounds per contest circle to be used at contests where a fly-off is included). Under exceptional circumstances, the FAI Jury may reduce the number of rounds.A maximum of four days is allowed for the elimination rounds in World and Continental Championships. At World and Continental Championships and other limited international contests, organisers shall also arrange an additional fly-off for the 15 competitors holding the best scores (plus any competitors with scores tying for the 15th place) after calculating placing at the end of the last elimination round. The fly-off shall consist of three separate fly-off rounds, all to be flown on the same contest flight circle.When the number of participating junior competitors is sufficient to give a title of World or Continental Junior Champion, organisers shall also arrange an additional fly-off for the 3 juniors holding the best scores (plus any juniors with scores tying for the 3rd place) after calculating placing at the end of the last elimination round. If any junior is in the overall top 15 and already flying in the fly-off, his/her open and junior fly-off flights will be the same.The flying order for each round shall be established by separate random draws. At World and Continental Championships and other limited international contests, all members of any single National Team shall be separated in the flying order of every round by at least one competitor from another nation. If two competitors from the same National Team are initially drawn to fly consecutively during any round, then the affected competitor will be redrawn to ensure that this separation requirement is met. Each competitor is entitled to two helpers for each contest flight. At World and Continental Championships and at other limited international contests, a helper may be a Team Manager, another competitor, or an officially registered supporter. – Manoeuvres omitted or not attempted at all. – Manoeuvres started but not completed. – Manoeuvres with an incorrect number of repeat figures (either too few or too many). – Manoeuvres flown out of the sequence. – Manoeuvres flown without a minimum of 1-1/2 laps interval after the previous manoeuvre. – or the model aircraft flips over at the moment of touching down. Note: if the model aircraft flips over during the ground rollout phase points may be awarded for the landing manoeuvre if in the opinion of the judges, the flip over was due to adverse wind conditions, or poor ground surface conditions affecting what would otherwise be predicted as the model aircraft’s normal ground roll after touching down. – the model aircraft fails the second official noise test (see paragraph 4.2.5). – any part(s) of the model aircraft become detached from the model aircraft (intentionally or otherwise) at any time from the moment of release for the take-off manoeuvre until the moment that the model aircraft first touches down from the landing manoeuvre. This does not apply to any part(s) of the model aircraft which detached during a crash, or a flip over, a belly or upside down landing. Aerobatic judges will be responsible for observing each attempt at an official flight and to record their awarded score for each manoeuvre as it is completed. Once an official flight has begun the judges may, of their own accord, change their original position, but such position change shall not exceed a maximum of 1/8 of a lap ahead of or behind their original position as at the beginning of the respective official flight. Judges shall only change position during the 1-1/2 intervening laps flown between manoeuvres and not while any manoeuvre is being flown.At Single-Circle format contests, the organiser must appoint a panel of at least three judges. In the case of World and Continental Championships and other limited international contests the panel of judges must be increased to five.At Double-Circle format contests, the organiser must appoint a panel of at least three judges for each contest flight circle. For the fly-off rounds (World and Continental Championships and other limited international contests), the panel of judges is increased to 5 judges ; those five judges are selected by the FAI Jury from the panels of judges for the elimination rounds. For each panel of judges, one judge is selected as Head Judge.At World and Continental Championships and other limited international contests, all the judges shall be selected from a list of persons proposed by the National Airsports Controls for their proficiency and experience and approved by the CIAM. In Open International contests, only two judges must be approved by CIAM for each panel of judges.At World and Continental Championships and other limited international contests, all the judges must be of different nationalities. In Open International contests, the judges must be of at least two nationalities for each panel of judges.Each judge shall be permanently appointed to judge at a specific contest flight circle for the duration of the contest, except at contests which include a fly-off. At contests which include a fly-off (World and Continental Championships and other limited international contests), judges shall be appointed to a specific contest flight circle for the duration of all elimination rounds.All judges appointed to the judging panel assigned to each contest flight circle shall judge every contest flight scheduled for their respective contest flight circle. But this requirement may be relaxed in exceptional circumstances, such as, but not limited to a judge becoming sick during a contest. In such event, the F2B Contest Director and the Head Judge shall confer (also together with an FAI Jury member) regarding the replacement of the missing judge.At World and Continental Championships and other limited entry international contests, there will be at least one judges’ calibration flight per contest day at each contest flight circle to be used. All such judges’ calibration flights shall take place before any contest flights are scheduled. All judges’ calibration flights shall include sufficient time for a judges’ briefing before and judges’ debriefing after each judges’ calibration flight. Said briefing and debriefing shall include the complete panel/s of judges and shall be held privately, with no contest organiser, official, or competitor present. The provision of judges’ calibration flights in Open International contests shall be optional but is recommended.All contest organisers shall arrange at least one judges’ meal break per contest day. If the judging panel/s request it, extra time shall also be scheduled for additional judges’ breaks (for example breaks of approximately 10 minutes duration at approximately 2 hourly intervals throughout each round).In any contest, no judge shall be scheduled to judge more than 50 contest flights or perform a total of more than 10 hours of judging duty (whichever is the longer) within any single contest day. This time shall include the above judges’ calibration flight(s) but does not include the breaks. a) The score for each manoeuvre corresponds to the original mark multiplied by the respective K-factor. The resulting scores for each manoeuvre shall then be added together to produce a single total score per judge. The resulting single total scores of the judges are totalled and then divided by the number of judges. The result will be rounded down to a two decimal places to produce the competitor’s final score per official flight. i) At Single-Circle format contests, organisers shall take each competitor’s two highest flight scores and add them together to produce the competitor’s final score for placing. In case of ties, the third flight score of the affected competitors shall be used to determine placing. ii) At Double-Circle format contests, organisers shall take each competitor’s highest score from each contest flight circle, add them together to produce the competitor’s final score for placing. In case of ties, the affected competitors’ second highest score from any of the contest flight circles shall be used to determine placing. iii) If, due to extraordinary circumstances, only two complete rounds were flown, then each competitor’s score from the two completed rounds shall be used to determine placings. i) At Single-Circle format Championships, organisers shall take each competitor’s two highest flight scores and add them together to produce the competitor’s score. ii) At Double-Circle format Championships, organisers shall take each competitor’s highest score from each contest flight circle, add them together to produce the competitor’s score. iii) If, due to extraordinary circumstances, only two complete rounds were flown, then each competitor’s score from the two completed rounds shall be used. – at Double-Circle format Championships, second highest score from any of the contest flight circles shall be used to determine placings of the affected competitors.In the case of a two way tie for 15th place at the end of the last elimination round, following competitor is placed 17th; in the case of a three way tie for 15th place the following competitor is number 18th; etc. d) To establish the national scores for team classification add the numerical placing of the three team members of each nation. Teams are ranked according to the lowest numerical sum of placings to highest, with complete three competitors teams ahead of two competitors teams which in turn are ranked ahead one competitor teams. e) At World and Continental Championships and other limited entry international contests, facsimile copies of the original judges’ score sheets from each official flight shall be given to the respective Team Manager or Assistant Team Manager before the competitor’s next flight in the contest, or at the latest at the end of each round of the contest. a) From the moment that he is officially called to enter the contest flight circle, each competitor shall be allowed 2 minutes to enter; to place his model aircraft on the ground at his selected starting position, to position the judging panel as he feels is appropriate and to confirm his selected take-off release position. Official timing of this 2 minute period shall start from the moment the competitor steps into the contest flight. 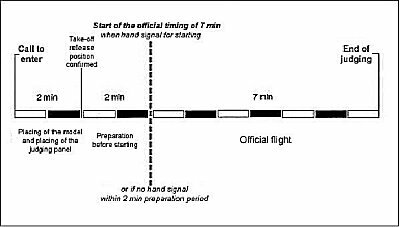 b) Once the competitor has confirmed his selected take-off release position, the official timing of a 2-minute preparation period before starting motor/s shall start. The official timekeeper shall inform the competitor when the official timing of this preparation period has been started and shall also signal the start of this period to the judging panel. c) An official flight (including motor/s starting) shall be completed within 7 minutes. d) The official timing of this period will normally start when the official timekeeper acknowledge the competitor’s clear hand signal given when ready to start but before actually starting his motor/s. But official timing shall in no case begin later than 2 minutes after the start of the preparation period. If the competitor has not given a clear hand signal to indicate he is ready for engine start before the 2-minute preparation period has expired, or if the competitor starts his motor/s without giving the hand signal and receiving acknowledgement, then the official timekeeper shall immediately inform the competitor and signal to the judging panel that official timing of this 7-minute period has started. e) The competitor shall give a clear hand signal prior to starting his motor/s and the official timekeeper must have acknowledged this before the competitor proceeds. Official timing shall therefore have started upon said acknowledgement. f) The timing of an official flight shall stop at the moment when the model aircraft has come to a full stop at the end of the ground roll that completes the landing manoeuvre. 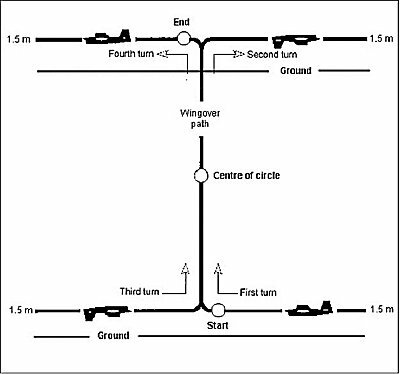 All manoeuvres must be executed in the order of the list.Every competitor shall leave at least 1-1/2 laps plus the recommended entry and exit procedure detailed for each manoeuvre to create a pause period between the end of one manoeuvre and the start of the next. The 1/2 intervening laps shall be flown at a height of between 1 and 3 metres. Judges shall not however officially observe any of these pause periods but instead shall use this time to enter the score awarded for the previous manoeuvre onto the competitor’s score sheet before the next manoeuvre is started. Manoeuvre Means the full total of figures and segments necessary to complete the manoeuvre marked under a separate numbered heading with bold type. As example of this: the take-off manoeuvre, the three consecutive inside loops manoeuvre, and the single four-leaf clover manoeuvre, are all referred to as a single whole manoeuvre throughout this text. Figure Means a shape, which makes up a separately recognisable complete part of a whole manoeuvre. 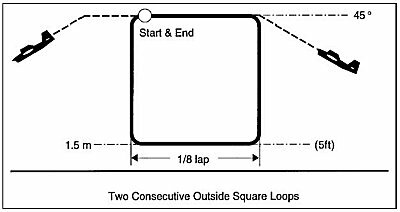 As an example, the first loop of the three consecutive inside loops manoeuvre is referred to as a figure ; but the first loop which makes the first half of the first complete figure eight in the two consecutive overhead eight manoeuvre is not referred to as a figure. Segment Means a specifically defined part of a figure (or of a whole manoeuvre) in which certain particular points are detailed. 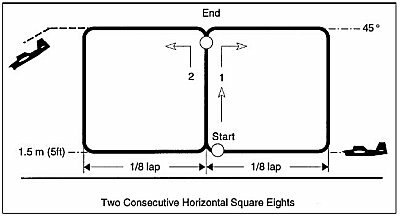 As an example, the first loop which makes the first half of the first complete figure eight in the two consecutive overhead eight manoeuvre is referred to as a segment. Upright Means the model aircraft flying in its “normal” upright attitude (that is: with its landing gear nearest to the ground). Inverted Means the model aircraft flying in an attitude which is reversed from upright flight (colloquially, the model aircraft is “flying on it’s back”, is “flying upside-down”, or is flying “inverted”). “Vertical” Means at right angles (perpendicular) to the ground over which the flying takes place. This word is marked with inverted commas (quotation marks) throughout this text to provide a constant reminder that the requirement is for model aircraft to fly at right angles to the ground, even if that ground has a perceptible slope. “Horizontal” Means parallel to the ground over which the flying takes place. This word is marked with inverted commas throughout this text to provide a constant reminder that the requirement is for model aircraft to fly parallel to the ground, even if that ground has a perceptible slope. “Straight line” Means the closest distance between two points as seen in two dimensions. These words are marked with inverted commas throughout to provide a constant reminder that the requirement (in all the square and triangular manoeuvres for example), is for a number of turns (“corners”) which should be joined together with flight paths which appear to be straight lines when seen by the pilot. Momentary or momentarily Are used throughout this text in their original dictionary definition sense (that is: something, which lasts only for a very brief period of time). So, for example, the very short period during which the model aircraft is required to be in a vertically-banked “knife-edge” attitude above the competitor’s head during the two consecutive overhead eights manoeuvre is described in this text as “momentarily”. Lateral reference Means an imaginary line drawn upwards at right angles (90 degrees) from the ground over which flying takes place. As used in this text, this term should be used as the reference point when flying and scoring the size, positioning, symmetry, and the superimposing of various figures and manoeuvres. As required by the respective manoeuvres, the text may refer to a lateral reference, to a lateral reference line, or to a lateral reference point. In this last case the text also defines the specific point (height) on that line where the lateral reference point should be located. 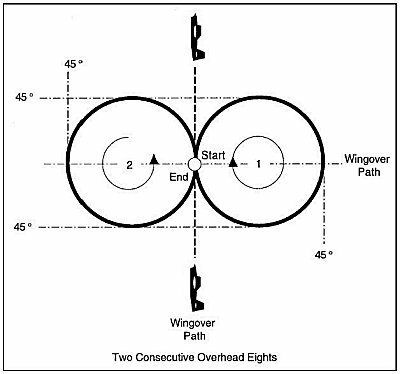 Wing-over path Means the vertical climbing plus diving flight path defined as a segment of the single reverse wingover manoeuvre. The remainder of the “Rules” is in the section entitled “F2B – PATTERN”, commencing with this Rule number. The PATTERN ONLY is listed here, with a more detailed description, courtesy of the rules book, shown below. The FAI produce a separate file with the Diagrams. For simplicity, a small version of each Diagram is included on this page. It MUST be noted that the diagrams are drawn to illustrate the PILOT’S VIEW, and NOT the Judge’s. The stunt pattern consists of a series of manoeuvres which must be flown in the specified order. They are judged out of 10 by judges sitting outside the flight circle. Each score is multiplied by a “k factor”, according to the difficulty of each manoeuvre and the scores totalled. The Judge’s scores are then averaged for a Round score. The appropriate Round scores are then averaged for a Final Score. All judges shall award a mark 10 (ten) if the model aircraft begins its ground roll for the take-off manoeuvre within 1 minute of giving the ready to start hand signal. Both manual and motor starting devices such as electric starters shall be permitted and the 10 points shall be awarded if the above 1 minute condition is fulfilled, whatever the method of motor starting used. – or the take-off ground roll begins more than 1 minute after his hand signal was acknowledged. a) Start of manoeuvre: at the moment when the model aircraft is released to start its ground roll. The model aircraft must take off from the ground. b) Ground roll and lift off segment: before lifting off the model aircraft should run along the ground for a distance of not less than 4.5 metres and not more than 1/4 of a lap. The lift-off should be smooth, meaning without a “sudden jump” into the air. c) Climb out and levelling-off segment: the model aircraft should maintain a constant rate of climb until reaching a height of 1.5 metres. The point of changing from climbing flight to level flight should occur exactly overhead the point of release at the beginning of the Take-off ground roll. The change into upright level flight should be smooth and gentle, with no sudden change/s in attitude. d) 2 laps of upright level flight segment: after levelling off the model aircraft should maintain a height of 1.5 metres and should fly 2 complete laps of stable and smooth normal upright flight, with no abrupt changes of attitude and without deviations of more than plus/minus 30 cm throughout this segment. e) End of manoeuvre: at the end of the third lap, exactly overhead the point of beginning the take-off ground roll. Recommended exit procedure: continue normal upright level flight at 1.5 metres. Note: all turns in this manoeuvre should be between 1.5 metres and 2.1 metres radius. Recommended entry procedure: from normal upright level flight at a height of 1.5 metres. a) Start of manoeuvre: at the beginning of the first turn from normal upright level flight into a “vertical” climb. b) The first “vertical” climb and dive segment: the model aircraft should turn sharply into a “vertical” climb and should then maintain a “straight line” climb that is at right angles to the ground. It should pass directly over the flyer’s head and then change into a “straight line” dive that is also at right angles to the ground. This dive should continue until the second turn, which should sharply turn the model aircraft from its dive into normal “straight line” inverted level flight at a height of 1.5 metres. c) The inverted “horizontal” level flight segment: after recovery from the first “vertical” dive and until the start of the turn into the second “vertical” climb, the model aircraft should fly a segment of smooth inverted level flight segment which is parallel to the ground at a height of 1.5 metres, with no height deviations of more than plus/minus 30 cm, and with no abrupt changes in attitude. The length of this segment, including turns, should be 1/2 a lap. d) The second “vertical” climb and dive segment: the model aircraft should turn sharply into a “vertical” climb and should then maintain a “straight line” climb that is at right angles to the ground. The model aircraft should pass directly over the flyer’s head and then change into a “straight line” dive that is also at right angles to the ground. This dive should continue until the fourth turn, which should sharply turn the model aircraft from its dive into normal “straight line” upright level flight at a height of 1.5 metres, that height to be met within plus/minus 30 cm. The point where the model aircraft starts its recovery turn into normal upright level flight at the end of the whole manoeuvre should be exactly opposite the point where the model aircraft first reached a “vertical” climb attitude at the start of the complete manoeuvre. e) End of manoeuvre: the end of the fourth turn (recovery to normal upright level flight). Manoeuvre size, overall: height 45 degrees line elevation angle; width 1/8th of a lap. a) Start of manoeuvre: at the start of the first loop, as the model aircraft departs normal upright level flight. b) The first loop figure: from normal upright level flight at 1.5 metres plus/minus 30 cm, the model aircraft should fly smoothly upwards along a circular flight path until reaching a height of line elevation angle 45 degrees. At that point the model aircraft should be inverted. Without interruption the model aircraft should continue its circular flight path downwards until passing the bottom of the loop at a height of 1.5 metres plus/minus 30 cm, in upright flight. The whole flight path should be circular and smooth, with no deviations and no flat spots. When the model aircraft reaches a “vertical” attitude for the first time this has defined the lateral reference line for the whole manoeuvre. c) The second and third loop figures: the model aircraft should follow a flight path exactly as described above. 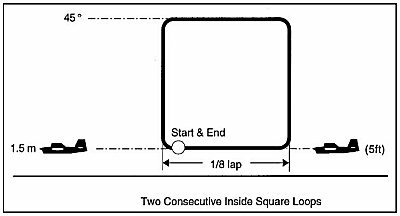 The second and third loops should be placed in exactly the same position as the first loop, and should be of exactly the same size. d) End of manoeuvre: at the end of the third loop, as the model aircraft completes recovery into normal upright level flight. 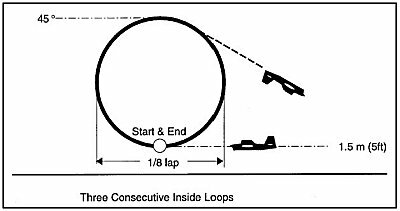 Recommended exit procedure: the model aircraft should continue for another half loop, recovering inverted and descending to the normal inverted flight level within 1/2 a lap, remaining inverted at a height of 1.5 metres. Recommended entry procedure: from inverted level flight at a height of 1.5 metres. a) Start of manoeuvre: at the start of the third lap after the exit from the previous manoeuvre. b) 2 laps of inverted flight segment: the model aircraft should maintain 2 complete laps of smooth and stable inverted flight at a height of 1.5 metres with no height deviations of more than plus/minus 30 cm, and with no abrupt changes of attitude. c) End of manoeuvre: at the end of the fourth lap after the exit from the previous manoeuvre. Recommended exit procedure: continue inverted flight, remaining at the normal level flight height of 1.5 metres until entry to the next manoeuvre. a) Start of manoeuvre: at the beginning of the first loop, as the model aircraft departs level inverted flight. d) End of manoeuvre: at the end of the third loop, as the model aircraft passes a height of 1.5 metres, plus/minus 30 cm, in inverted level flight. Recommended exit procedure: continue for another half loop, recovering to upright flight and then descending to the normal upright level height of 1.5 metres. a) Start of manoeuvre: at the point where the model aircraft begins its first turn into a “vertical” climb from normal upright level flight. b) First loop figure – first turn plus “vertical” climbing segment: the model aircraft should sharply turn into, and then steadily maintain, a “straight line” climb that is at right angles to the ground. c) First loop figure – second turn plus top “horizontal” segment: the model aircraft should turn sharply into, and then steadily maintain inverted level flight at a height of 45 degrees line angle elevation. The level portion of this flight path should be parallel to the ground. d) First loop figure – third turn plus “vertical” diving segment: the model aircraft should sharply turn into, and then steadily maintain, a “straight line” dive that is at right angles to the ground. e) First loop figure – fourth turn plus bottom “horizontal” segment: the model aircraft should sharply turn into, and then steadily maintain upright level flight at a height of 1.5 metres, plus/minus 30 cm, The level portion of the flight path should be parallel to the ground and the total length of the bottom segment, including both turns, should be 1/8th of a lap. f) The second loop figure: the model aircraft should follow a flight path exactly as described in the segments above. The second loop should be placed in exactly the same position as the first loop, and should be of exactly the same size. g) End of manoeuvre: in normal upright level flight at a height of 1.5 metres, plus/minus 30 cm, at the point where the model aircraft started its first turn into a “vertical” climb at the beginning of the complete manoeuvre. Recommended exit procedure: maintain normal upright level flight at 1.5 metres. Recommended entry procedure: use ¾ of a lap to climb to a height of 45 degrees line elevation angle and maintain this height in upright level flight for 1/8th of a lap. a) Start of manoeuvre: at the point where the model aircraft begins its first turn into a “vertical” dive from 45 degrees line elevation angle. b) First loop figure – first turn plus “vertical” diving segment: the model aircraft should sharply turn into, and then steadily maintain, a “straight line” dive that is at right angles to the ground. c) First loop figure – second turn plus bottom “horizontal” segment: the model aircraft should turn sharply into, and then maintain smooth and steady inverted level flight at a height of 1.5 metres without deviating by more than plus/minus 30 cm. 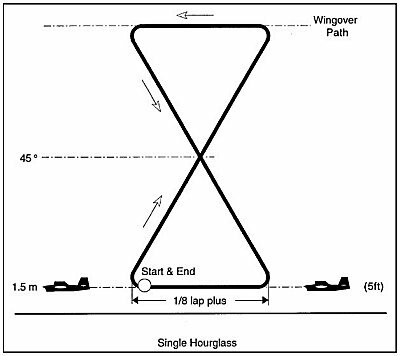 The level portion of this flight path should be parallel to the ground and the total length of the bottom segment, including both turns, should be exactly 1/8th of a lap. d) First loop figure – third turn plus “vertical” climbing segment: the model aircraft should sharply turn into, and then steadily maintain, a “straight line” climb that is at right angles to the ground. e) First loop figure – fourth turn plus top “horizontal” segment: the model aircraft should sharply turn into, and then steadily maintain upright level flight at a height of 45 degrees line elevation angle. The level portion of this flight path should be parallel to the ground. g) End of manoeuvre: in upright level flight at a height of 45 degrees line elevation angle, at the same point where the model aircraft started its first turn at the beginning of the complete manoeuvre. Recommended exit procedure: maintain upright level flight at a height of 45 degrees line elevation angle for at least 1.0 metre after the end of the manoeuvre and then descend to the normal upright level flight height (1.5 metres) within approximately 1/2 a lap. Note: all turns in this manoeuvre should be between 1.5 metres and 2.1 metres radius. In each turn the model aircraft should change its angle of pitch attitude by approximately 120 degrees. Manoeuvre size, overall: height 45 degrees line elevation angle; width slightly more than 1/8th of a lap. a) Start of manoeuvre: from the point in normal upright level flight where the model aircraft starts its first turn. b) First triangle figure – first turn and climb segment: the model aircraft should turn sharply into a “straight line” inverted climb and the angle of this flight path should be at 30 degrees beyond vertical in relation to the ground. After completing the turn the model aircraft should maintain this flight path until starting the second turn. c) First triangle figure – second turn and dive segment: the model aircraft turn sharply into a “straight line” inverted dive and the angle of this flight path should be at 60 degrees (that is: 30 degrees less than vertical in relation to the ground). After completing the turn the model aircraft should maintain this flight path until starting the third turn. The height reached during this second turn should not be more or less than a line elevation angle of 45 degrees. d) First triangle figure – third turn plus bottom “horizontal” segment: the aircraft should sharply turn into an upright “straight line” level flight at a height of 1.5 metres, plus/minus 30 cm. 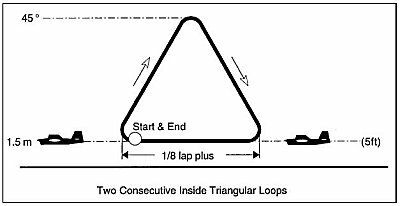 The length of all 3 sides of this triangular loop (including two turns per side) should be equal, and the bottom segment, including both turns, should be slightly more than 1/8th of a lap in length. e) The second triangular loop figure: the model aircraft should follow a flight path exactly as described in the three segments above. The second loop should be placed in exactly the same position as the first loop, and should be of exactly the same size. f) End of manoeuvre: with the model aircraft in normal upright level flight, at the point where the model aircraft started its first turn at the start of the complete manoeuvre. Manoeuvre size, overall: height 45 degrees line elevation angle; width 1/4 of a lap. a) Start of manoeuvre: when the model aircraft passes the intersection point for the first time. Note: when the model aircraft reaches a “vertical” climbing attitude for the first time this has defined the intersection point for the whole manoeuvre (that is: after 1/4 of the first loop of the first eight has been flown). b) The first eight figure – first inside loop segment: from normal upright level flight the model aircraft should fly upwards along a circular flight path to a height of line elevation angle 45 degrees, at which point it should be inverted. The model aircraft should continue its circular flight path downwards without interruption until reaching the normal upright level flight height of 1.5 metres, plus/minus 30 cm, at which point it should be upright. The model aircraft should then continue, without interruption, its circular flight path for a further 1/4 of a loop until reaching the intersection point, at which point the model aircraft should be momentarily “vertical”. Note: the intersection point first defined by the model aircraft at the beginning of this manoeuvre should be maintained throughout the whole of the manoeuvre. At the time of passing through the intersection point and transitioning to the first outside loop the model aircraft should be momentarily in a “vertical” nose up attitude but should not visibly travel in a “straight line”, nor travel along a “vertical” climbing flight path. c) The first eight figure – the outside loop segment (actually 1 complete loop from the intersection point onwards): after passing through the intersection point the model aircraft should continue, without interruption, to fly a complete outside loop by flying upwards along a circular flight path to a height of 45 degrees line elevation angle, at which point the model aircraft should be upright. The model aircraft should continue its circular flight path downwards, without interruptions, until reaching the inverted flight height of 1.5 metres, plus/minus 30 cm, at which point it should be inverted. The model aircraft should then continue, without interruption, its circular flight path for a further 1/4 of a loop until reaching the intersection point, at which point it should be momentarily “vertical”. d) The second complete eight figure: the model aircraft should follow a flight path exactly as set out in the individual segments above. The second figure eight should be flown in exactly the same position and should be of exactly the same size as the first eight figure. 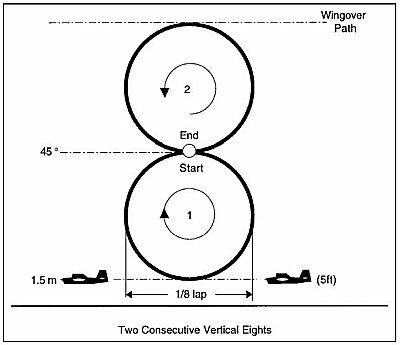 e) End of manoeuvre: as the model aircraft completes the second eight figure, when passing the intersection point in a “vertical” climb for the fifth and last time. a) Start of manoeuvre: with the model aircraft in normal upright level flight, from the point where the model aircraft starts its first turn upwards into a “vertical” climb for the first time. Note: when the model aircraft reaches a “vertical” climbing attitude for the first time, this has defined the intersection line for the whole manoeuvre. b) The first eight figure – the first climbing turn and “vertical” climbing segment of the first (inside) square loop: the model aircraft should turn sharply into a “vertical” climb, reaching and maintaining a “straight line” flight path that is at right angles to the ground. c) The first eight figure – the second turn and top “horizontal” segment of the first (inside) square loop: the model aircraft should turn sharply into inverted level flight to reach a height of 45 degrees line angle elevation as it becomes inverted. This section should be parallel to the ground. d) The first eight figure – the third turn and “vertical” dive segment of the first (inside) square loop: the model aircraft should turn sharply into a “vertical” dive, reaching and maintaining a “straight line” flight path that is at right angles to the ground. e) The first eight figure – the fourth turn and bottom “horizontal” segment of the first (inside) square loop: the model aircraft should turn sharply into smooth upright level flight, and this section should be parallel to the ground at a height of 1.5 metres, plus/minus 30 cm, The length of the whole bottom segment, including both turns, should be exactly 1/8th of a lap. f) The first eight figure – the first climbing turn and “vertical” climb segment of the second (outside) square loop: at the end of the previous segment (paragraph e) above), the model aircraft should turn sharply into a “vertical” climb, reaching and maintaining a “straight line” flight path which is at right angles to the ground. This flight path should be in exactly the same position as defined by the model aircraft at the beginning of the manoeuvre (paragraph a) above). g) The first eight figure – the second turn and top “horizontal” segment of the second (outside) square loop: the model aircraft should turn sharply into upright level flight to reach a height of 45 degrees line elevation angle as it becomes level. The top segment should be flown with the flight path parallel to the ground. h) The first eight figure – the third turn “vertical” dive segment of the second (outside) square loop: the model aircraft should turn sharply into a “vertical” dive, reaching and maintaining a “straight line” flight path that is at right angles to the ground. i) The first eight figure – the fourth turn and bottom “horizontal” segment of the second (outside) square loop: the model aircraft should turn sharply into inverted smooth level flight, and this section should be parallel to the ground at a height of 1.5 metres plus/minus 30 cm. The length of the whole bottom segment, including both turns, should be exactly 1/8th of a lap. j) The second eight figure: the model aircraft should follow a flight path exactly as set out in the individual segments above. The second eight figure should be flown in exactly the same position and should be of exactly the same size as the first eight figure. k) The final turn and last “vertical” climb exit from manoeuvre segment: at the end of the second bottom “horizontal” segment of the fourth loop the model aircraft should again turn sharply into a “vertical” climb, reaching and maintaining a “straight line” flight path which is at right angles to the ground. This flight path should be in exactly the same position as defined by the model aircraft at the start of the manoeuvre (paragraphs a) and b) above). l) End of manoeuvre: at the end of the last vertical climb segment, before turning into normal upright exit flight at 45 degrees line angle. Recommended exit procedure: complete a further 90 degrees turn into “straight line” upright level flight at a height of 45 degrees line angle. Maintain this level flight path parallel to the ground until clear of the left hand side of the left hand loop by approximately 5.0 metres then make a turn into a dive of approximately 45 degrees nose down attitude. Recover into normal upright level flight at 1.5 metres. Manoeuvre size, overall: height 90 degrees line elevation angle; width 1/8th of a lap. Recommended entry procedure: from normal upright level flight at a height of 1.5 metres, fly upward along a circular flight path to a height of line elevation angle 45 degrees. At this point the model aircraft should be inverted. a) Start of manoeuvre: after the model aircraft has flown the first half of an inside loop, as it passes through the intersection point for the first time. Note: the intersection of the whole manoeuvre is defined when the model aircraft passes through inverted level flight at a height of 45 degrees line elevation angle for the first time. b) The first eight figure – the first (inside loop) segment: as the model aircraft passes through the intersection point for the first time it should continue to fly a completely circular inside loop with no flat spots or deviations. The bottom of this loop should be at a height of 1.5 metres, plus/minus 30 cm. 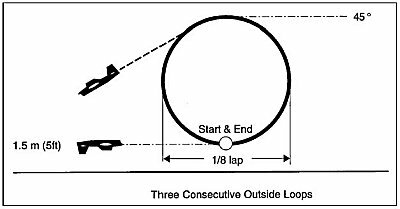 The loop should be completed by the model aircraft continuing this circular flight path until reaching an inverted attitude at a height of 45 degrees line elevation angle. c) The first eight figure – the second (outside loop) segment: as it passes through the intersection point the model aircraft should continue without interruption, flying a completely circular outside loop without flat spots or deviations. The bottom of this second loop should be at a height of 45 degrees line elevation angle and the top should be at 90 degree line elevation. Note: the flight path of this second loop should touch the intersection point, and this intersection point should be maintained throughout the entire manoeuvre. At the time of passing through the intersection point and then transitioning into the second (outside) loop, the model aircraft should be momentarily in a level inverted flight attitude but should not visibly follow a “straight line” flight path. Neither should the model aircraft climb nor dive during this momentary period of inverted flight. In addition, the centres of both loops should be positioned on an imaginary line drawn upwards from the ground at right angles. d) The second eight figure: the model aircraft should follow a flight path exactly as set out in the individual segments above. The second figure eight should be flown in exactly the same position and should be of exactly the same size as the first eight figure. e) End of manoeuvre: as the model aircraft completes the second eight figure, at the moment when it reaches inverted level flight at a height of 45 degrees line elevation angle. Recommended exit procedure: continue for a further half inside loop until the model aircraft is upright at a height of 1.5 metres, and then continue in normal level upright flight at a height of 1.5 metres. In each turn the model aircraft should change its angle of pitch attitude by approximately 120 degrees. Manoeuvre size, overall: height 90 degrees line elevation angle; width slightly more than 1/8th of a lap. a) Start of manoeuvre: from the point where the model aircraft starts its first turn into a climb for the first time. b) The first turn and inverted climb segment: The model aircraft should sharply turn into, and then maintain an inverted climb with a “straight line” flight path angled at approximately 30 degrees past right angles (relative to the ground). The climb should be continued until a sharp outside turn that then results in the model aircraft following the wing-over manoeuvre flight path. That wing-over flight path should be positioned at 90 degrees to the centre line axis of the whole manoeuvre and the middle point of this flight path should be positioned directly above the centre of the circle. c) The overhead second turn, wingover, and third turn segment: the “straight line” overhead wing-over flight path should be positioned at 90 degrees to the centre line axis of the whole manoeuvre and the mid point of the flight path should be positioned directly over the centre of the circle. The length of this segment, including its two turns, should be slightly more than 1/8th of a lap. This segment should be finished with a sharp outside turn through approximately 60 degrees into an inverted dive. d) The inverted dive segment: the model aircraft should turn sharply into, and then maintain, an inverted dive with a “straight line” flight path angled at approximately 60 degrees relative to the ground. e) The intersection: the intersection of the “straight line” climb and the “straight line” dive flight paths should be at a height of 45 degrees line elevation angle. f) The fourth turn and bottom level flight segment: the model aircraft should sharply turn into normal upright level flight at a height of 1.5 metres, plus/minus 30 cm. The length of this segment, including two turns, should be slightly more than 1/8th of a lap. g) Symmetry of the complete manoeuvre: the figure should be flown symmetrically in relation to its “vertical” centre line axis, and this centre line axis should be at right angles to the ground. h) End of manoeuvre: at exactly the same point as the model aircraft started its first turn at the start of the complete manoeuvre. Recommended exit procedure: continue in normal upright level flight at 1.5 metres. Manoeuvre size, overall: loop diameters 1/8th of a lap; lowest points of both loops at 45 degrees line elevation angle. Recommended entry procedure: from normal upright level flight the model aircraft should climb in a wing-over flight path to a point directly over the centre of the circle. a) Start of manoeuvre: as the model aircraft passes through the overhead point for the first time. Note: the intersection point of the complete manoeuvre should be directly over the centre of the circle and should be maintained throughout this entire manoeuvre. b) The first complete (inside loop) segment: from the overhead position the model aircraft should fly a completely circular inside loop, returning to the overhead/intersection point. The right hand bottom of this loop should all be at a height of 45 degrees line elevation angle. This loop should be positioned symmetrically on an imaginary line on the face of the flying hemisphere which is drawn upwards at 90 degrees to the axis of the model aircraft’s wing-over climb to the intersection point. c) The passage through the intersection point and transition into the second (outside) loop segment: as the model aircraft passes through the intersection/overhead point, it should smoothly transition into the second (outside) loop without flat spots or deviations. At the point of flying directly above the centre of the circle the model aircraft should be momentarily in a “knife edge” position with a line elevation angle of 90 degrees. d) The second complete (outside loop) segment: from the overhead position the model aircraft should transition smoothly into the second completely circular (outside) loop, completing this loop when it has again returned to the overhead/inter-section point. The left hand bottom of this loop should be all at a height of 45 degrees line elevation angle. Those bottoms should also all be positioned symmetrically on an imaginary line on the face of the flying hemisphere which is drawn upwards at 90 degrees to the axis of the model aircraft’s climb to the intersection point (paragraph c) above). e) The second eight figure: the model aircraft should fly the second eight figure exactly as set out in the individual segments above and this second eight figure should be flown in exactly the same position and should be of exactly the same size as the first eight figure. f) End of manoeuvre: at the end of the second (outside) loop of the second eight figure, as the model aircraft passes through the intersection point. Recommended exit procedure: continue by completing most of the second (diving) half of the wing-over flight path that was used to start the manoeuvre. Then recover into normal upright level flight at 1.5 metres. Manoeuvre size, overall: height 90 degrees line elevation angle; width ¼ lap. Recommended entry procedure: use ¾ of a lap to climb to a height of 42 degrees line elevation angle and maintain this height in upright level flight for 1/8th of a lap. a) Start of manoeuvre: at the point of entry into the first (inside) loop. b) The first complete (inside) loop figure: “complete loop” (above) means a full circular loop of 360 degrees. The top of this first loop should be tangential to the wing-over path located at 90 degrees to the centre line axis of the whole manoeuvre. The model aircraft should recover into upright level flight at a height of 42 degrees line elevation angle. This loop should be positioned tangentially to an imaginary “vertical” line drawn upwards at right angles from the ground. The lateral position of this line is determined when the model aircraft reaches a “vertical” attitude for the first time and this imaginary line then becomes the lateral reference for the whole manoeuvre. c) The upright level flight at 42 degrees line elevation angle segment: at 42 degrees line elevation angle the model aircraft should fly on an upright level flight path that is parallel to the ground. The length of this segment should be equal to the diameter of the first loop. d) The second (outside) 3/4 of a loop segment: “3/4 of a loop” means a circular arc of 270 degrees. This 3/4 loop should be flown as a true arc without visible deviations from a circular flight path and the bottom should be at a height of 1.5 metres, plus/minus 30 cm. This 3/4 loop should end with the model aircraft entering a “vertical” climb whose flight path is the same as the great circle line resulting from flying the first loop. e) The first “vertical” climb segment: the model aircraft should climb “vertically” at right angles to ground and the length of this segment should be equal to the diameter of the first loop. f) The third (outside) 3/4 loop segment: this 3/4 loop should be flown as a true arc without visible deviations from a circular flight path and the bottom should be at a height of 42 degrees line elevation. This 3/4 loop should end with the model aircraft recovering to inverted level flight at a height of 42 degrees line elevation angle. g) The inverted level flight at 42 degrees line elevation angle segment : the model aircraft should follow an inverted flight path which is parallel to the ground. The length of this segment should be equal to the diameter of the first loop. h) The fourth (inside) 3/4 loop segment: this 3/4 loop should be flown as a true arc without visible deviations from a circular flight path and the bottom should be at a height of 1.5 metres, plus/minus 30 cm. This 3/4 loop should end with the model aircraft entering a “vertical” climb whose flight path is the same as the great circle line resulting from flying the first loop. 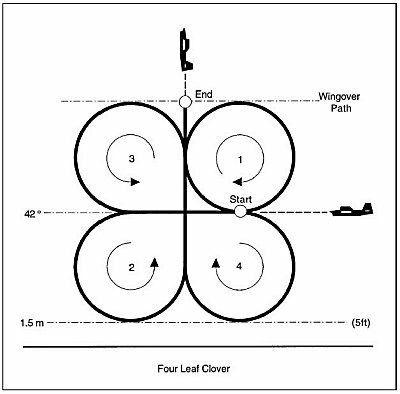 i) The second “vertical” climb segment: the model aircraft should climb “vertically” at right angles to ground and the length of this segment should be such that the model aircraft flies through the complete clover leaf figure. j) End of manoeuvre: at the end of the last “vertical” climb, as the model aircraft passes through a point directly above the centre of the circle. Recommended exit procedure: continue the wing-over path from the last vertical climb (paragraph i) above) into a “vertical dive”, then recover into normal upright level flight at 1.5 metres. Other manoeuvring after completion of the cloverleaf is permitted. a) Start of manoeuvre: as the model aircraft leaves a height of 1.5 metres, plus/minus 30 cm, and with the motor/s stopped (gliding flight). b) The descent segment: the model aircraft should fly for 1 full gliding lap (power off condition), measured from the start of the descent at the 1.5 metres plus/minus 30 cm height, until the point of touchdown. The rate of descent should remain constant throughout this whole gliding lap, from the moment that it leaves the 1.5 metres height until the moment that it touches down. The touch down itself should be smooth and either a “2 point” or a “3 point” touch down shall be judged as being equally correct. c) End of manoeuvre: when the model aircraft comes to a complete stop after touching down at the end of the ground roll which is clearly in a forwards direction and in line with its normal flight motion. The length of the ground roll shall not exceed one lap.